Every year I help Italian charity "La Collina dei Conigli" with my pictures to raise awareness and funds about their activities. 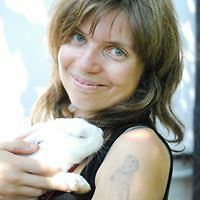 La Collina dei Conigli rescues rabbits, mice, rats and Guinea pigs who were used as "test subjects" in labs; when they are fully recovered (sometimes it takes years), volunteers look for a new forever-home where they can finally live free and loved. I'm not a professional photographer (I work in the Communications field), but photography is my passion together with animals, so I'm always honored and very, very happy to help this amazing charity with my pictures! I'm also a proud member of HeArts Speak international network of photographers for animals. After Alice in Wonderland and The Little Prince, this year the theme of the photosession were children books and fairytales, because they teach us that we can reach a happy ending even through hard times and that each of us can be a hero. It took more or less 12 hours to have all the pictures taken (and a lot of time to create and find scene objects, even with other volunteers' help!). My hope is that my pictures can help to spread the world and the work of La Collina dei Conigli and that adoption, the real happy end for my wonderful models, can finally be written! The results are featured in 2017 calendar of La Collina dei Conigli, which you can buy to support the charity. #1 Opicina In "The Secret Garden"
#2 The Mice Crew In "Cinderella"
So darling! The mice were always my favorite part of Cinderella's story. #3 Audrey In "Around The World In 80 Days"
I hope Audrey discovers her forever home soon! 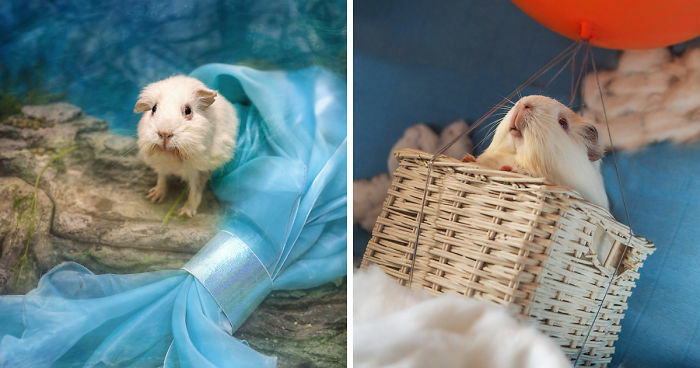 #4 Paquita In "The Little Mermaid"
Is it an elderly guinea? #5 Pouf And Poseidone In "Beauty And The Beast"
#6 Cilla And Kauri In "aladdin"
I don't understand who would want to test make-up products in a lab on these adorable animals! #7 Gianni, Michele And Sam In "Peter Pan"
Middle rat checking the moon-made-of-cheese theory. #8 Piero And Pelù In "Hansel And Gretel"
#9 Il Carota In "The Enchantment Of Adoption"
#10 Hati, Leda And Tebe In "The Wizard Of Oz"
I know you rescued these babies, do you have the back story to whats wrong with the cutie on the left's eye? #11 Liga And Vasco In "A Christmas Carol"
Bless your heart and also the rescuers hearts! I cannot believe people are STILL submitting innocent animals to lab testing! IT MUST BE STOPPED! #12 Stella Del Mattino In "Dumbo"
What a lovely picture of another beautiful creature with big, fuzzy ears! I rescued 5 abandoned, abused bunnies over 20 years and every one of them was a gift from God! ;o) Bonnie Wabbit, Thumper, George, Clint (he made my day) and Floyd (he was such a pretty boy) have all crossed over The Rainbow Bridge! #13 Sabotino In "Little Red Riding Hood"
This is such honorable work. I would adopt from this organization if I lived there. Born in the 80s, vegan, animal lover, alt-rock listener, and more optimist than I could ever admit. Photography makes me happy. I love poppies too! BLESS YOU for doing this. I have such a soft spot for animals, I only shop cruelty free, and I was almost in tears looking at these photos. I am definitely not a fan of rats and mice, but I would definitely open my home to these sweeties. Cruelty free is amazing! Go vegan to really show your love and compassion for all innocent animals! You can do it! These sweet babies. Thank you for all that you do!